Saturday, I went on a lovely trip to Kew Gardens with Annie, Mex, Nikki and Julian (the links go to their photos). Unfortunately, Evan had to work. 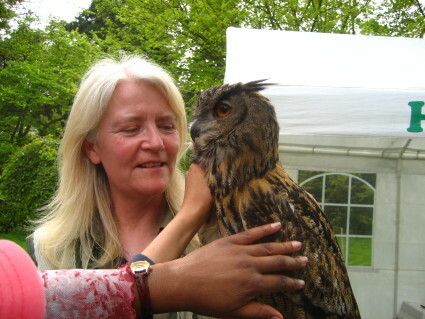 For the bank holiday weekend, there is a Woodland Fair going on at Kew, and there were horse-drawn carriage rides, craftsmen, Morris dancers and a falconry show. I didn’t get to see all of the different gardens in the park, or go in the palm house, though, so hopefully I’ll get back there soon. We got to touch an owl — its feathers were soft. 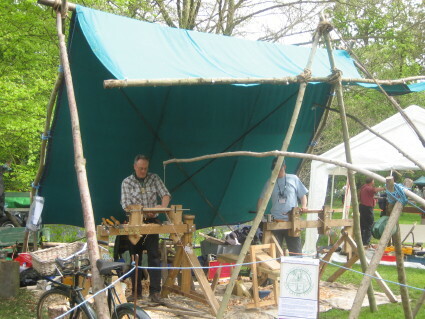 There were woodworkers turning wood by foot power — those long sticks attached to a strong wrapped around the piece of wood, and turned it back and forth. 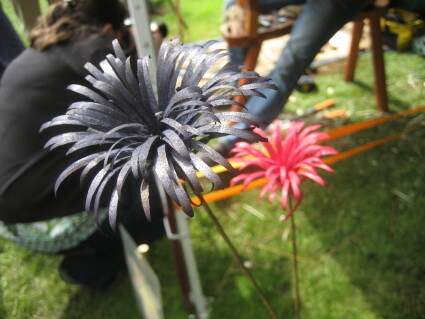 There were also cute crafts like these wood May flowers. 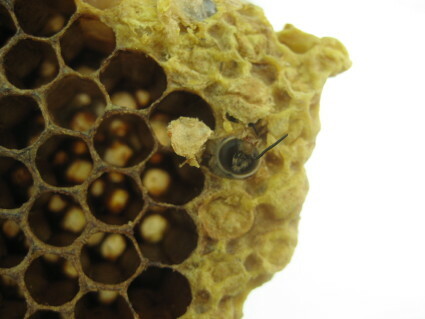 We saw bees emerging from their pupal cases — this one was had only popped his head out. I also bought some pollen collected from the bees’ legs, and there were many different types of honey to buy. There were morris dancers putting on a show — they danced around with bells on their shoes and legs and smacking their sticks together. 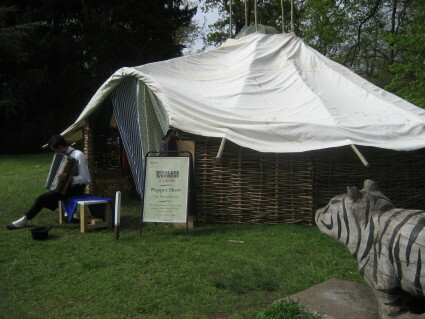 There were also lots of yurts — here’s a wooden tiger overlooking the accordion player in front of the puppet show yurt. Check out the rest of my photos on Flickr. Hi Francine – lovely shot of the bees and the wooden May Flowers. Yes a video was certainly needed for the err “wandering musicians” as you say it was one of the stranger moments of the day. Glad you enjoyed it. I went yesterday with four other friends but we went quite late and did more of the usual Kew stuff – Palm House, wandering by the lake & river, rhodendron dell, Japanese stuff – so you’ll deffo have to come back again to take in Kew’s more “normal” but beautiful stuff! I was originally going to say crazy people surrounded by crazier people, but I was trying to be diplomatic. If only I could recreate that moment — those were some incredibly enthusiastic hippies. Fantastic.. The shot of the bee appearing is great. 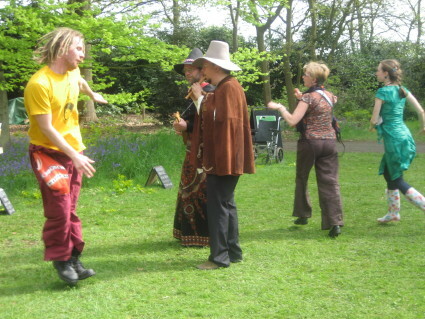 And yeah, those people dancing were very amusing – oh to have the kind of self confidence needed for that. And nice morris dancer description.. *laughing* No mention of wierdness at all! Thanks, Fimb. The macro setting did a good job on that one! 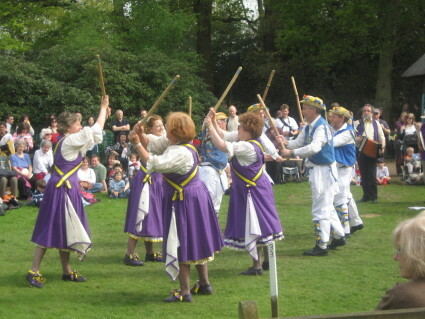 And I have more of those morris dancer photos where they’re waving the sticks about and they really do look like they’re about to beat each other! But his feathers were really soft. I think it showed how interactive it was — I mean, we really got to touch that owl — no one-finger-on-the-back type deal!